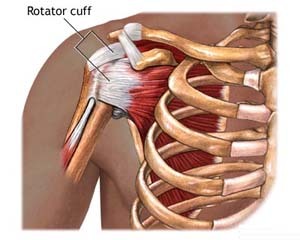 The rotator cuff is the group of four tendons that stabilize the shoulder joint. 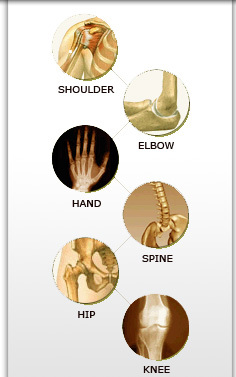 The tendons hook up to the four muscles that move the shoulder in various directions. There are four muscles whose tendons form the rotator cuff: the subscapularis muscle, which moves the arm by turning it inward (internal rotation); the supraspinatus muscle, which is responsible for elevating the arm and moving it away from the body; the infraspinatus muscle, which assists the lifting of the arm during turning the arm outward (external rotation); and the teres minor muscle, which also helps in the outward turning of the arm. Rotator cuff disease is damage to the rotator cuff from any cause. Rotator Cuff Disease condition is one of the most common causes of shoulder pain. A common cause of shoulder pain, rotator cuff disease can be due to trauma (e.g., from falling and injuring the shoulder or from overuse in sports particularly involving repetitive overhead motions), inflammation (e.g., from tendinitis, bursitis, or arthritis of the shoulder) or degeneration (e.g., from aging). The main symptom is shoulder pain of gradual or sudden onset, typically located to the front and side of the shoulder, increasing when the shoulder is moved away from the body. A person with tears to the rotator cuff tendons may not be able to hold the arm up because of pain. With very severe tears, the arm falls due to weakness (positive drop sign). The diagnosis of rotator cuff disease can be objectively confirmed by x-rays showing bony injuries from long-standing severe rotator cuff disease; an arthrogram in which contrast dye is injected into the shoulder joint to detect leakage out of the injured rotator cuff; or, preferably, an MRI which can provide more information than an X-ray or an arthrogram.